Kurdish President Masoud Barzani To Step Down Amid Fallout From Secession Vote : The Two-Way Since Iraq's Kurdish region voted to secede last month, Kurds have reeled from territorial losses. Now, their president and longtime leader, Masoud Barzani, has declared he'll step down Wednesday. 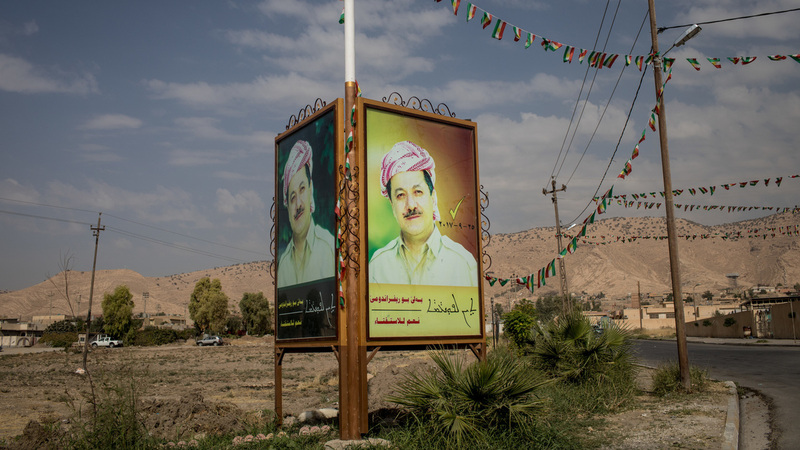 A portrait of Kurdish President Massud Barzani looks out over Alqosh, Iraq. Just over a month since Iraq's Kurdish north voted to declare independence, setting in motion a disastrous series of events for the region, Kurdish President Masoud Barzani has told local lawmakers he intends to step down. "I refuse to continue in the position of president of the region after November 1," Barzani said in a letter delivered to the regional Parliament, according to Reuters. "I will continue serving Kurdistan as a Peshmerga [Kurdish soldier]." It will now fall to local lawmakers — who approved Barzani's resignation Sunday — to determine how to redistribute his authorities after his term expires Wednesday. As NPR's Jane Arraf notes, elections were originally scheduled for that date but were delayed until next year amid the recent turmoil. Barzani's controversial decision stands in the long shadow of the nonbinding referendum held late last month, in which members of the Kurdish ethnic minority voted overwhelmingly to secede from Iraq. Despite Kurds' relative autonomy within the country — and despite strong warning against holding the referendum at all, both from Baghdad and allies such as the U.S. — Barzani promised at the time that "we are ready to pay any price for our independence." Indeed, that referendum has proven costly. Not long after the vote was held, Iraqi forces pushed into Kirkuk, reclaiming the oil-rich city that Kurds had controlled since 2014. Baghdad also sought to isolate Kurdish leadership by closing international airspace and seizing other major oilfields in the region. Taken together, the moves turned off "overnight more than half the Kurdish region's revenues and [left] it with little hand to play in negotiations," according to The Guardian. Despite the troubles of recent weeks, Barzani has long enjoyed the stature of a "father figure" among his supporters, as Jane puts it. He has served as the region's president since 2005 — but the 73-year-old played a prominent role in Kurdish politics for decades before that, as leader of the Kurdistan Democratic Party his father helped establish. Iraqi Kurdish men protest as Rabon Maarouf, an independent member of Kurdistan's Parliament, gives a press conference Sunday in Erbil. "There was basically a shoving match outside of Parliament. Now, it was declared a closed session so journalists weren't allowed inside — but one of the opposition parliamentarians came out, and some of the party journalists loyal to Barzani decided that [the parliamentarian] was being disrespectful. And they started shoving, and he retreated indoors." Even as the end of Barzani's tenure approaches, his similarly pugilistic tone in a televised speech Sunday made clear he's likely to remain a major voice in Kurdish politics — and a major voice in defense of independence. 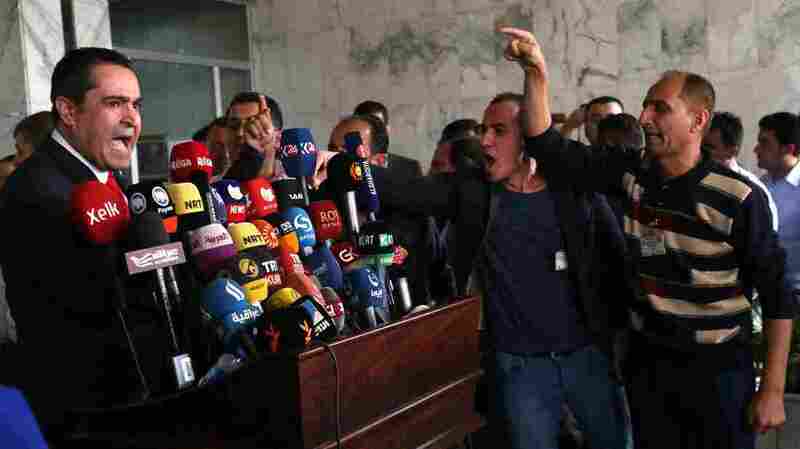 "Three million votes for Kurdistan independence created history and cannot be erased," he said Sunday, as Reuters reports. "Nobody stood up with us other than our mountains."